The new 2018 Ford Aspire facelift will see some significant updates over the outgoing one and will be a better package than before. The car will get a new engine along with tweaks to the exterior and interior due to which it will now take the fight a step closer with its rivals. 2018 Ford Aspire Launch, prices, specs and more! That's all we have for you from the launch, Express Drives signing off. 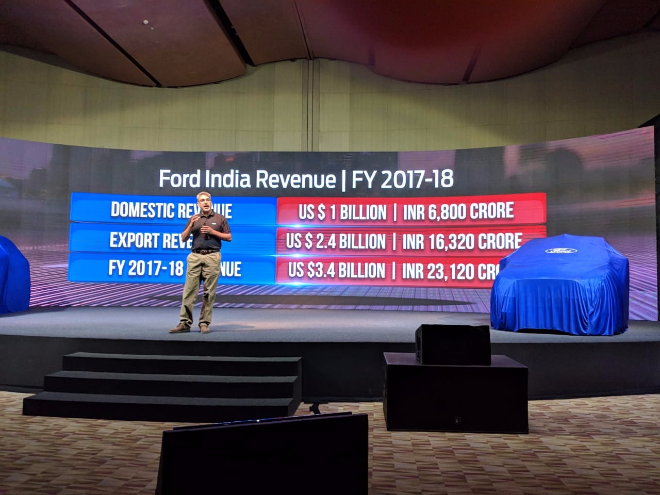 Ford Mahindra Partnership details emerge! Chemistry with Mahindra has been great and we are making huge progress with this partnership. The 5 MoUs including developing B segment and C segment SUV is on track. We will announce more on this partnership soon. 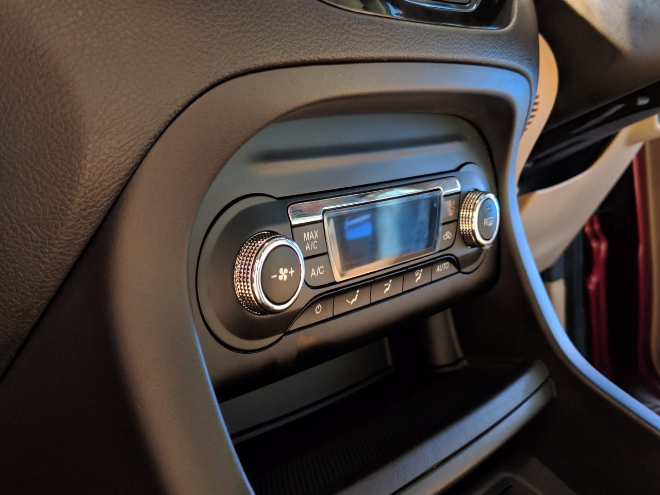 2018 Ford Aspire In Pictures: Climate Control has been delivered! Opposed to what we had expected, the Climate Control Feature has been added on the new Aspire, with an automatic climate control and an independent rear AC controller! With black accents to the beige interiors. The Aspire does look a lot more premium on the inside than the outgoing car. 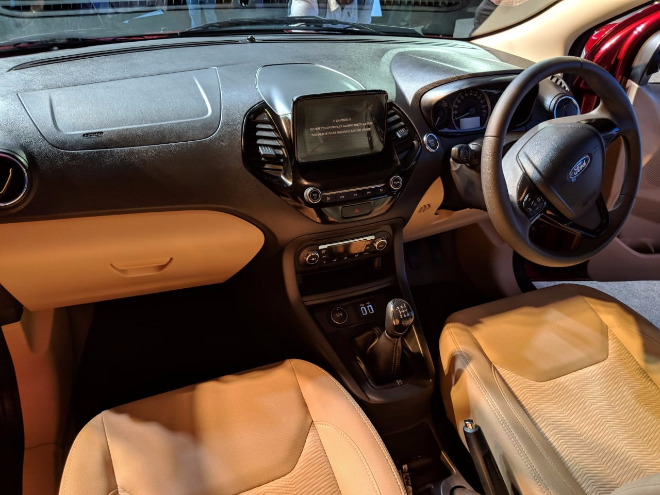 Like the EcoSport the Aspire, also get a floating type infotainment system with Apple Car Play and Android Auto connect for smartphones! The 2018 Ford Aspire also get 15-inch Wheels, as we had expected. While the alloys add a bit of flair, the up-sized wheels fill the recess' better. The Chrome Grill Sure adds some character to the otherwise bland Aspire! Without making it too blingy. 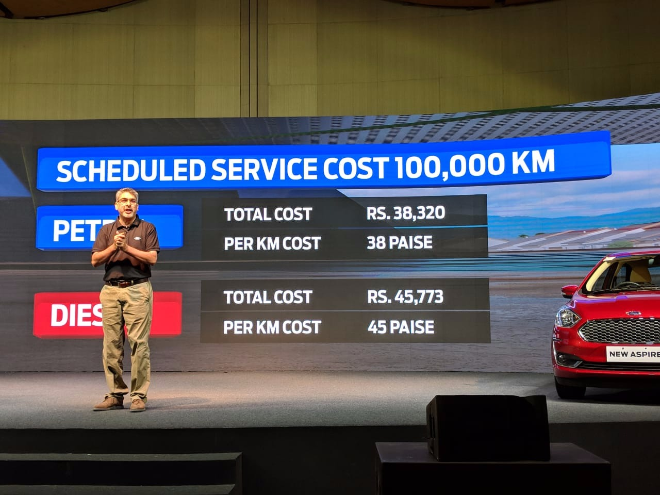 According to Ford, the cost of running an Aspire petrol, aside from accidental cost, are as little as Rs 38,320 for 10 lakh Kms. That's 38 paise a Km! With a diesel motor, this cost goes up to 45,773. A little over 45 paise a Km. Ford has launched the Aspire at an introductory price of Rs 5.55 lakh. Which is lower than the outgoing car, this is the edge that Ford needed in a packed marketplace to get ahead. Hopefully, this along with a strong set of features will ensure that the Aspire gets a strong edge over the competition. Ford has pulled the wraps on the new Aspire. 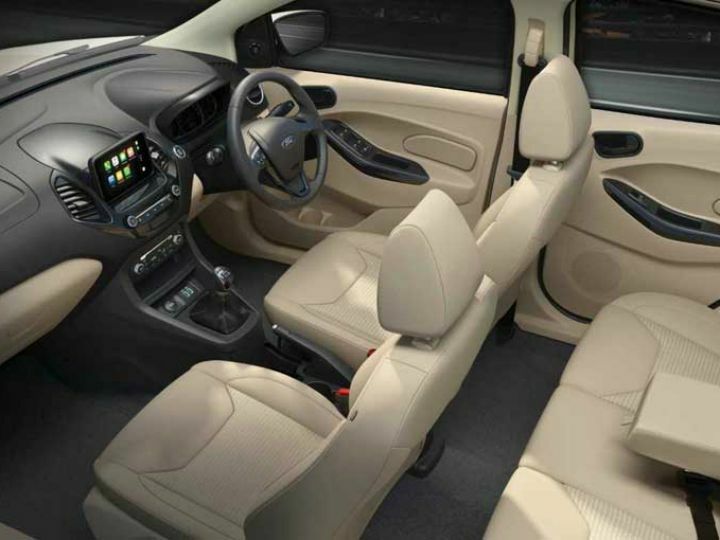 The new Aspire is very spacious and the sub-4-meter rule does not mean it is compromised on space says Vinay Raina. 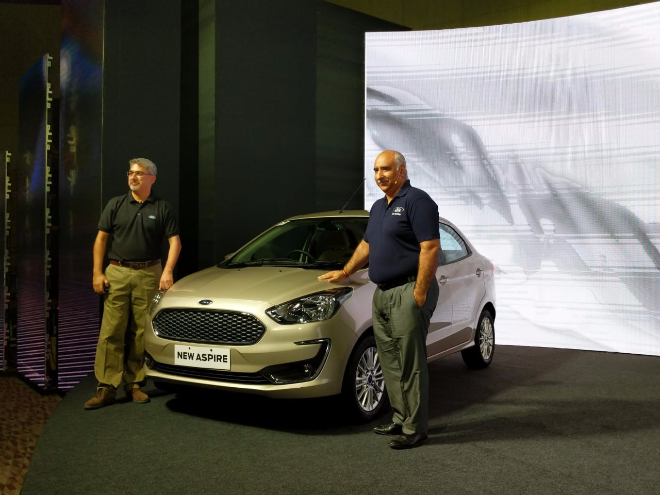 Over 50% of product development for new models are done by Ford's India team. 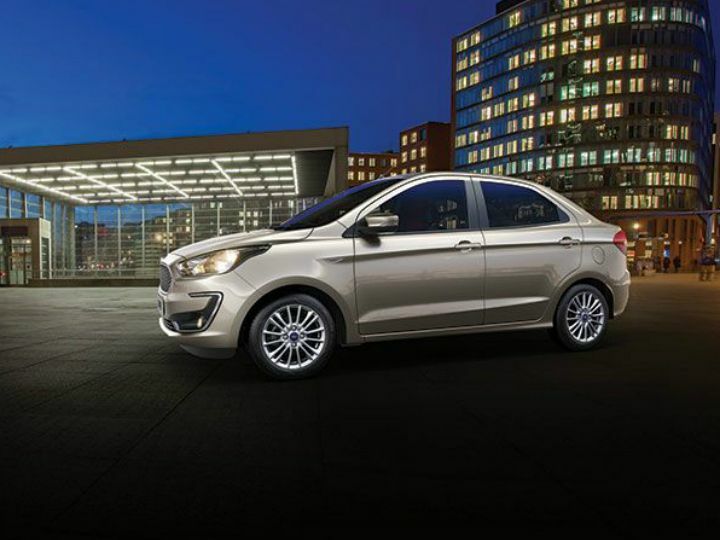 According to Ford India estimates that the sub-compact sedan space will double the demand by 2020. The demand in this space will go up to over 8lakh cars annually. A process that started with 60-65% localisation on EcoSport in 2013. Now all cars have over 80% local content says Anurag Mehrotra, MD, Ford India. Continuing that Ford's servicing in India is very affordable with all pricing being monitored online. 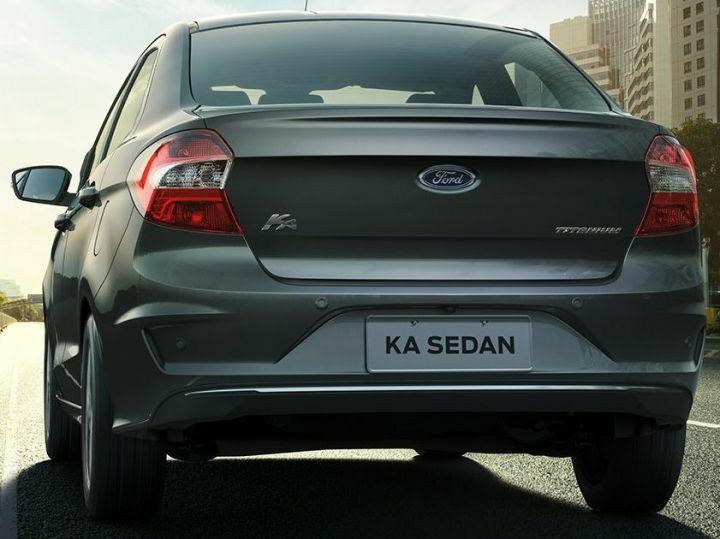 Ford India believes that its success has come with the right products at competitive cost with effective scaling. This has helped the company to build a strong brand. Our sales and service process have been revamped using deep customer incentives. 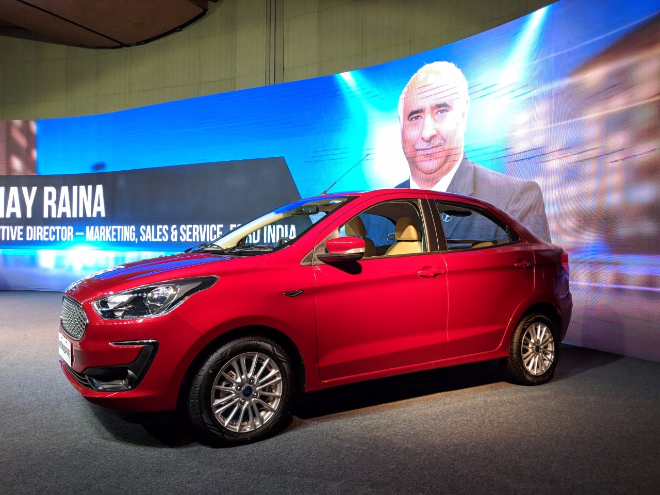 Ford India looks back at their time in the country! 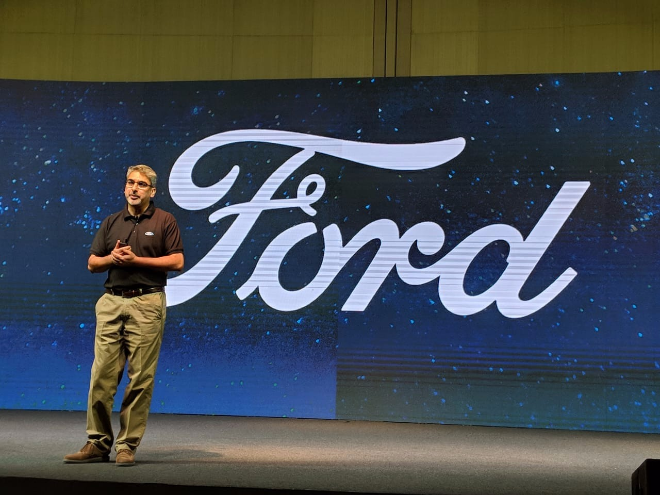 Ford's time in India has been marked by the sale of over 1 lakh cars, over 5 lakh customers have been added to the Ford India Family in the last 5 years. The result for the company has meant Rs 22,000 crore in revenue of which Rs 7,000 crore is exclusively from domestic revenue. The Stage is set for the launch stand by for more from the launch of the new Aspire! Just a few moments away from the launch! We are on the ground at the launch. Stand by as more information continues to flow in! 2019 Ford Aspire Automatic ? 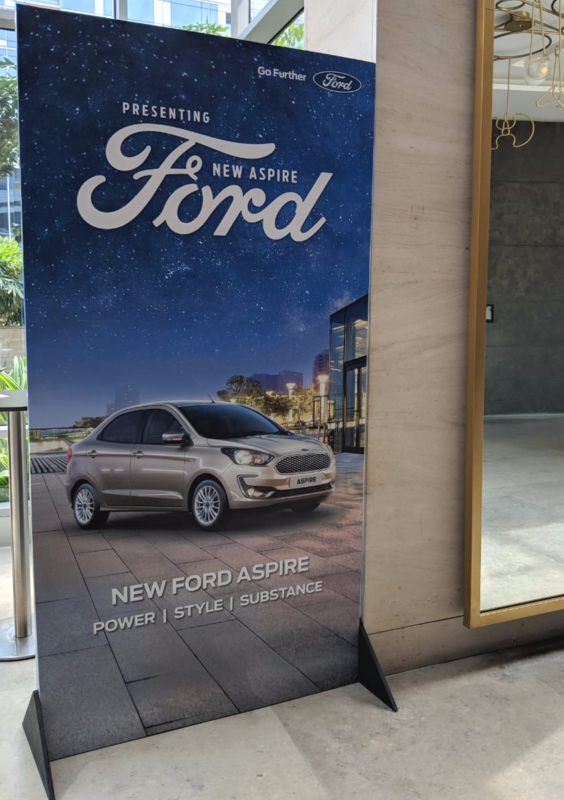 One of the more anticipated details from the launch of the new Ford Aspire is whether Ford will bite the bullet and bring the Aspire with an automatic gearbox. If they do offer an automatic alternative it is likely to feature with a 1.5-litre petrol motor. While the Dragon Petrol 1.2-litre motor and the 1.5-litre diesel are expected to be paired with a 5-Speed manual gearbox. On the interiors, while the new Aspire is likely to feature the same beige interior theme, one can expect a lot more in terms of features. Centring it all will be the new 6.5-inch touchscreen SYNC3 infotainment system. 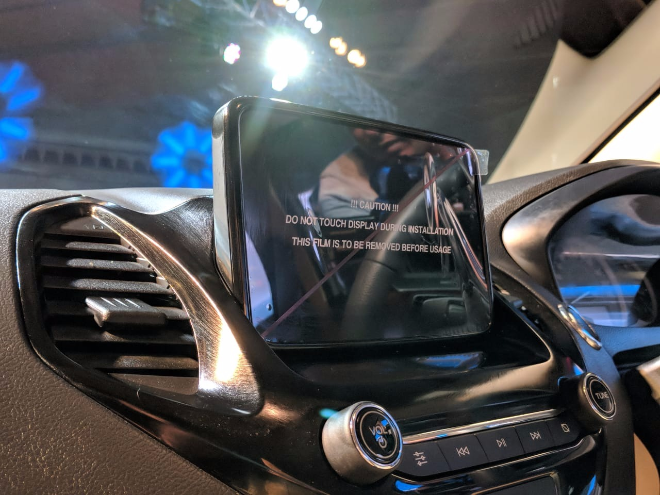 The new system is expected to offer some competition par features like Android Auto and Apple CarPlay smartphone connectivity only on the top-of-the-line variant, almost every variant of the new compact-sedan will get a touchscreen-based infotainment system. 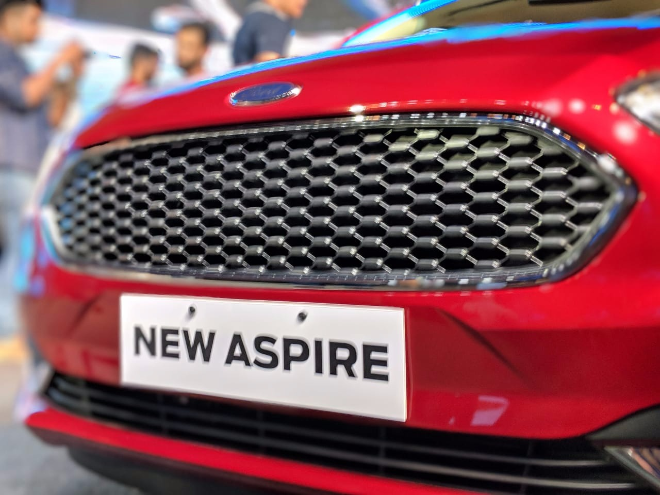 Other features that we expect to debut on 2019 Aspire include cruise control, automatic headlamps and rain-sensing wipers. We expect that the big miss on the Aspire to be climate control, which is pretty standard in the segment already, in comparison to the standard HVAC that the Aspire will debut with. In the back, the changes on the new bumper are cuts and creases, in addition to some chrome highlights that come together to make the Aspire look a lot less bulky. While the tail-lamp looks a lot like the car that it replaces. The creases on the bumper have been redesigned to make the lines between the two smoother, this adds some visual ease to the Aspire making it look more svelte than before despite the sinews. 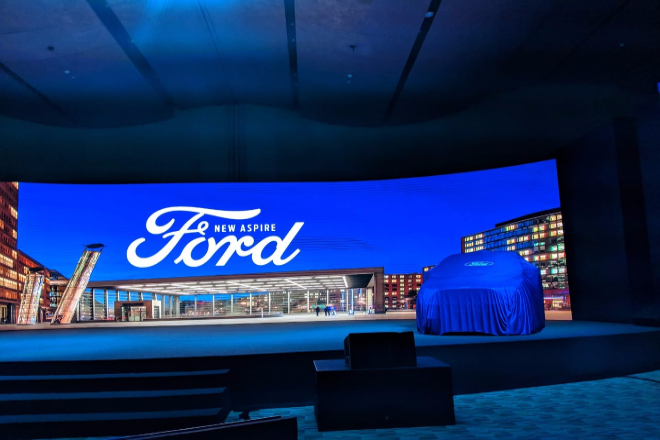 2019 Ford Aspire: What to Expect? With the new 2018 Aspire, Ford will be looking to add a bit of flair to what was up until this point quite a bland car. Don't expect drastic changes from the outgoing car, rather, the facelifted Aspire will bring new touches that are set to draw attention to the car. A lot of features on the Aspire will come from the Freestyle that Ford launched earlier than this. Included as part of this is the new chrome grille which is slightly more protruding than the older car. The new car will also feature a wider air-dam, and C-shaped chrome inserts that accent the fog lamps. On the flanks, subtle tweaks continue with slightly wider ORVMs that add to the aesthetic appeal and should also allow for a slightly wider field of view. 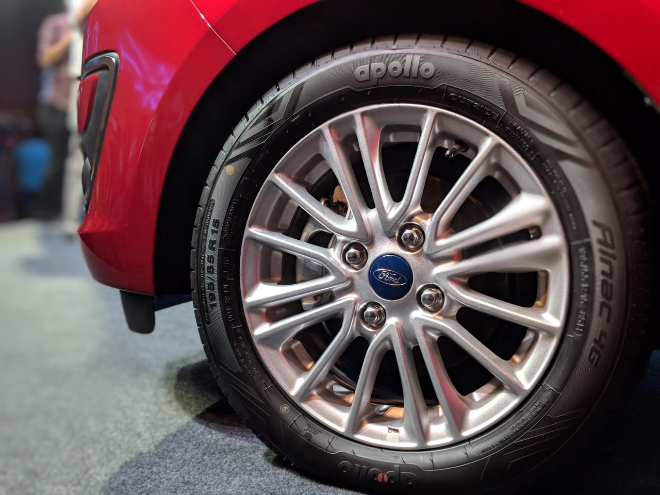 The Aspire will also get larger 15-inch multi-spoke wheels, this will help to remove those awkward looking wheel arch gaps and also add to the driving experience. 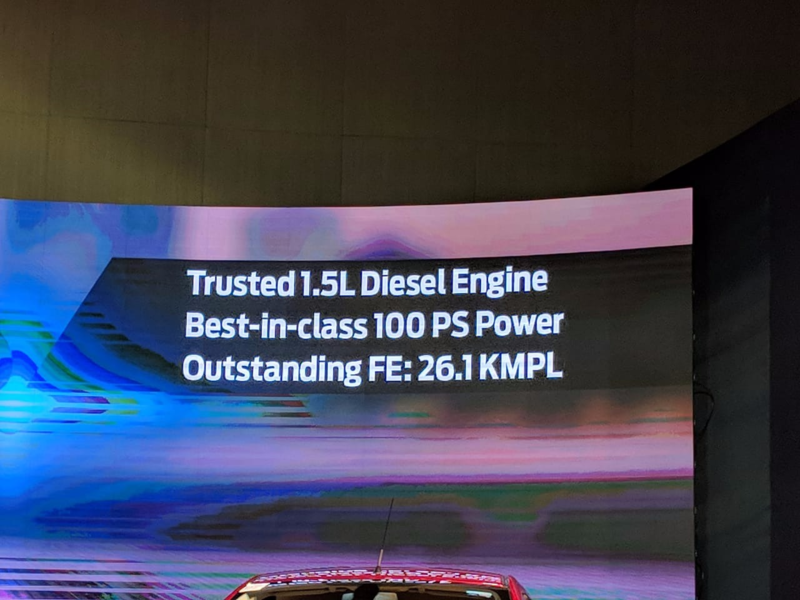 Now the Aspire in India will share a lot of cues in terms of design with the Figo Sedan currently on sale in South Africa. Interestingly, both cars are made in India. The only difference between the two is the fact that while the Figo on sale in SA is a standard sedan, the Aspire will be a sub-compact sedan under the 4 metre mark. 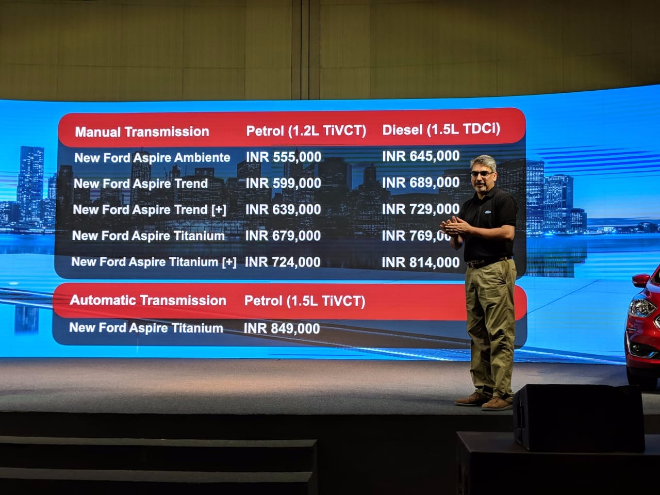 Price wise expect the Ford Aspire to command a slight premium over the outgoing car, we estimate that starting prices for the new Aspire will be around Rs 6 lakh while top-variants might set you back by around Rs 9 lakh. Now, in an already crowded segment, a lot depends on the pricing in a market as price sensitive as this. Stand-by as the prices are set to launch in a matter of a few hours. We can safely expect the new Ford Aspire to be powered by the same 1.5-litre diesel motor as the outgoing car. This motor is likely to make power to the tune of 100 hp and 215 Nm of torque and will be mated to a five-speed manual gearbox. 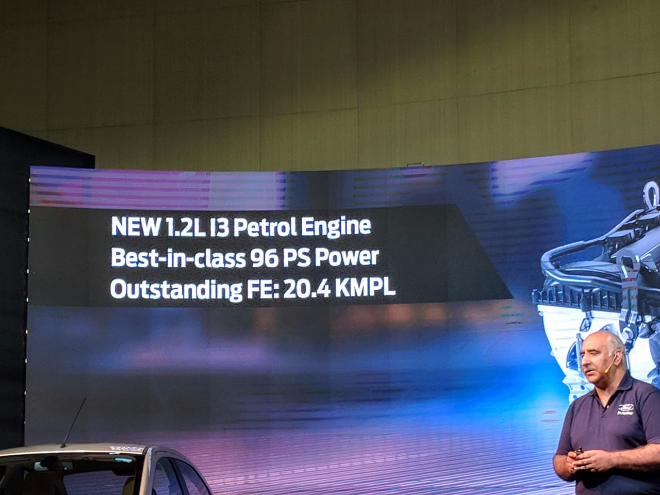 Aside from this motor, expect the new Aspire to also benefit from Ford's dragon series motor, the 1.2-litre petrol like on the freestyle will make 96 hp and 120 Nm of torque. The Aspire will share a lot of details with the Ford Freestyle that we drove earlier this year. Watch our video review of the new Freestyle while you wait to get an idea of what to expect from the new Ford Aspire.